This year, Vacation Bible School is open to all ages!!!! We hope each one of you will plan to come for a time of fun, fellowship and faith formation! This year’s VBS is Monday, June 17 – Friday, June 21, 2019, from 6:00 – 8:30 PM. A meal will be served each evening from 6:00 – 6:30, and then we will break out into activities for all ages. This year’s theme is God’s Good Creation! Not only will we be enjoying fellowship and spiritual growth, we will also be taking up a collection for Heifer International! In order to adequately plan for meals and activities, we need a count of each person attending (both adults and children). Please fill out the form below for each person who is attending VBS. We look forward to a week of fun together! The most meaningful time of year for Christians is Holy Week. It begins Sunday, April 14 during 11:00 am worship, with the children leading the palms processional as we recognize Palm Sunday – Jesus’ triumphant entry into Jerusalem. Thursday, April 18 at 7:00 pm, we reenact the Last Supper in this most Brethren of services – the Love Feast. We share in fellowship with a simple meal. We share in service by washing one another’s feet. We share in love and remembrance with communion. All (those who are not members or even Brethren) are welcome to participate or observe, as you are comfortable. Friday, April 19 at 7:30 pm, we will host the Community Good Friday Service, where we contemplate the crucifixion of Christ. This meditative service features a time of silence, Scripture reflections and the combined choirs from NCOB and the Nokesville United Methodist Church singing a response to each reading to reinforce the mood. The week culminates with the celebration of the Resurrection – the Easter Sunday service at 11:00 am. 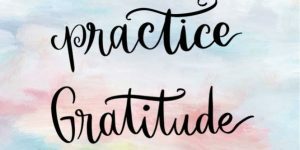 In order to truly appreciate the joy of this service, it is important to make it a priority to experience the events of the week that leads up to it. Commit to walking in the footsteps of Jesus on his journey to the cross, and to celebrating his victory over death. Please bring $10 for the workshop – we will use note cards as part of the workshop, and the money will go towards Major Maintenance. Invite your friends. Due to the snow and potentially dangerous travel conditions, we will not be having our traditional church service this Sunday, January 13. We pray that you are home, safe and warm. However, we didn’t want to miss an opportunity to worship our Creator God – the maker of all seasons. So, grab a cup of tea, coffee or hot chocolate, and prepare to worship in this “nontraditional” way, knowing that your praise is music to God’s ears. Rejoice, friends, Jesus is in our midst, no matter where we worship. Feed us, Jesus, and fill us with hope. Be glad, friends, Jesus has bread and fish to spare. Free us, Jesus, from the pursuit of food that does not satisfy. God gathers up the pieces of our lives, that nothing may be lost. Like the Psalmist, we ask you: “Where can we go from your Spirit? Where can we flee from your presence?” And you assure us that: “If we go up to the heavens, you are there; if we make our beds in the depths, you are there. Lord, even though we are not gathered together for worship this morning, still you are with us, and you receive our worship gladly. For this, and all the other blessings, mercy and forgiveness you bestow upon us, we thank you. Since we are not together to pray this morning, please join me in a bidding prayer. Read along in prayer, and then insert the names and things on your heart where guided. Though your flock is not together in body, we are gathered in spirit and in praise to you. This morning, we are reminded of the power that is not ours to wield. We are made to rest, and to take note of the awesomeness of your creation. Lord, we are grateful for this time to reflect on all that you are, and on how dependent we are on you. Thank you for the warmth of our homes, for the provision of food, for the love of those near us. We are grateful for the men and women who are even now out in the storm taking care of our needs: the police and firemen, the utilities workers, the doctors and nurses, and the plow drivers. Lord, bless them. Lord, we are concerned for those who are ill or alone during this time of storm. Bring comfort and healing to those in need. Make us mindful of those we may be able to help. Lord, bringer of peace – in times of rest, our brains often remain busy. We worry. What will the storm bring? What will tomorrow bring? Are we prepared? These worries may reflect cares far beyond the current weather. Help us to turn our worries over to you. Strengthen our faith to know that you are working. Give us courage to let go of our need to control, and to let your abundant plan for our lives play out. Thank you for this day and for your unending presence with us. Since you didn’t have to spend any time today driving over to the church, I’m going to assign a longer Scripture reading than usual. Please pull up your favorite translation or paraphrase of the Bible and read the entire 6th Chapter of the Gospel of John. Yes, the whole thing. It really will help you with the sermon if you’ve read the Scripture first. (If you click on the sermon title, you will see a video of the sermon. This is NOT the sermon I had intended to give on January 13. I’ll save that one for you live. However, I recorded this one in my house today, and it fits well with the theme we are exploring). We now have secure, online giving available through a link here on our website. If you are led, please feel free to make your weekly tithe or offering. Thank you Lord, for making a way to intentionally spend time in worship and praise. As we continue about our day, may your name be on our lips and your ways be our ways. 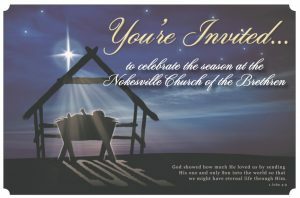 On Saturday, December 2, following the Nokesville Christmas Parade (which begins at 4 pm), gather on the church lawn at 5 pm for the telling of the Christmas story, complete with choir singing Christmas carols, children re-enacting the story, and live animals. We’ll finish with a candlelighting. Then, gather inside for the Community Chili Dinner. $5.00/person donation (children 12 & under are free). All proceeds benefit the Nokesville School lunch program and the Community Blessings Box. Free horse-drawn carriage rides leave from the church all evening. All are welcome to sing in the choir during the Live Nativity. Come to the choir room at 4:45 to get your caroling booklet. We also need desserts (which you can drop by any time after 9 am on Saturday) and help setting up tables and chairs at 9am Sat. morning. For those wishing to help decorate tables and prepare to serve food, please arrive at 3 pm. Contact Jeannette with questions. Many hands make light work, and this is a fun event with the community.